In 1965, British company Casselloid struck a deal with Hasbro for the rights to manufacture the new GI Joe doll in the UK. Casselloid's toy division, Palitoy, rebranded the toy "Action Man." When the smaller Star Wars figures began to dominate the market, Palitoy moved to copy their success, developing a 3¾" line they would call Action Force. Coincidentally, Hasbro had the same idea, and eventually Palitoy began licensing those figures, as well. Sometimes the molds were used to create the same characters, and sometimes they were used to make someone new. Quarrel is the daughter of a Swiss diplomat who was too busy to spend any time with her while she was growing up. To gain his admiration, she spent her early years training and excelling in martial arts, and eventually becoming well known as an all-around sportswoman. Although she was a top ranking competitor in the annual British Grand Prix Motorcycle Championships, she sought even more adventure and joined the S.A.F. (Special Action Force). Their Z Force infantry, armor and artillery unit gave her new challenges as well as unlimited access to high speed vehicles. She graduated at the top of her class in undercover ops school and advanced unarmed combat school. Although normally passive, she has the reflexes to explode into violent action at any moment. Her signature weapons include a modified crossbow, throwing stars (shurikens) and Chinese butterfly knives (dao). Quarrel is a daredevil on any motorcycle in the Z Force motor pool and always finds a way to use that to her advantage. She has been assigned a mission to investigate the reports of an eerie glow emanating from a closed factory, where unusual industrial manufacturing can be heard throughout the night. When Quarrel was released circa 1984, she was just a repaint of Scarlett. In fact, she was the only female figure ever released as part of the original Action Force. Perhaps unsurprisingly, this figure uses the same head seen on Hasbro's other update of an international hero, Glenda. This time her hair is blonde instead of red, though. While Glenda/"Pilot Scarlett" got new lower legs, this figure goes back to the originals, which means she really is just a striaght repaint of box set Scarlett. That's true to her origins, but if Daina can be tweaked with some unexpected parts, why can't Quarrel? That said, the paint job is very nice. All the "Z Force" (which was a real subline of the toys) figures wore green and black outfits, and this figure keeps that alive. She has red accents, such as her belt, the knife sheath on her right leg and the shurikens on her left glove, while the grenade on her shoulder is painted silver. 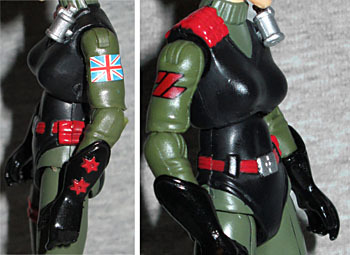 The Z Force logo is on her right sleeve, and she's got a Union Jack on her left. The dark colors make this look like a real military uniform, while the red details keep it from looking boring. While the body is reused from Scarlett, the accessories aren't. At least, not all of them. And not all from the same Scarlett. She's got the same helmet and backpack as Pilot Scarlett, the crossbow of Resolute Scarlett, then a pistol and a machine gun from... anywhere. Doesn't matter. All the weapons are solid silver, and the backpack and helmet are green. Her display base is silver, rather than black - apparently the Club plans to signify the "foreign" figures with these special bases. Why single them out? Because reasons, I guess. Back in the day, Quarrel was available only with the Z Force Rapid Fire Motorcycle - Action Force's version of the RAM. She's been the subject of many fan customs (being a quick and easy repaint and all), but this official version - even as a GI Joe Collectors' Club Figure Subscription Service exclusive - is much preferable. Plus, since her only official appearance in the fiction was a single panel during "World War III," it's cool how her filecard and the Nano-BAT's combine to hint at a shared continuity. And as a bonus for old school fans, this filecard keeps all Quarrel's established info - not just the bio, but her name, her place of birth, and even her serial number are the same today as they were back then.